Washington, DC | www.adc.org | November 23, 2015 – The American-Arab Anti-Discrimination Committee (ADC) has observed that many anti-Arab stereotypes and xenophobic myths have made their way into the public discourse about how the U.S. should deal with refugees fleeing persecution in Syria and Iraq. Fiction: Governors have the legal authority to accept or reject refugees for resettlement in their states. Fact: Thirty U.S. Governors have publically stated that they oppose accepting refugees for resettlement in their states. They do not have the power to determine refugee resettlement policy in their states. Fiction: Rejecting refugees will protect us from terrorist attacks. Fact: Many politicians have used the Paris attacks as justification to oppose accepting Syrian and Iraqi refugees for resettlement in the US. Fiction: It has been proven that some of the terrorists who committed the Paris attacks were Syrian and Iraqi refugees. Fact: Most of the Paris attackers were European citizens born in France or Belgium. Two of them appear to have entered Europe through Greece although it doesn’t appear that they came in through a refugee program. Following the attacks, the French President declared that France would accept 30,000 Syrian refugees over the next two years. Fiction: Some of the Syrian and Iraqi refugees who have been resettled in the U.S. have committed acts of terrorism. Fact: Politicians say the Syrian and Iraqi refugees might be terrorists, and therefore we shouldn’t accept any of them. Fiction: The majority of refugees are young males looking to wage a religious war on America. Fact: According to the UNHCR, three-quarters of Syrian refugees are women and children. Fiction: Refugees will spread their extremist views to America. Fact: Syrian refugees are fleeing persecution from ISIS and other violent extremist groups. Fiction: Terrorists are more likely to be Arab Muslims. Fact: The majority of terrorist attacks in the U.S. are committed by homegrown white males. Fiction: Discriminating on the basis of national origin will make America safer. Fact: The U.S. House of Representatives voted 289 to 137 to pass an anti-Refugee bill called the “American Security Against Foreign Enemies (SAFE) Act.” The House vote represents a vote for fear and xenophobia. It also discriminates against Syrians and Iraqis on the basis of their national origin in contradiction to stated American values. Fiction: The SAFE Act will ensure that we keep the terrorists out of America because top security officials can guarantee that each refugee is not a terrorist. Fact: If it becomes law, this bill would require the most stringent vetting for refugees ever. It would require the nation’s top three security officials — the Homeland Security secretary, FBI director and national intelligence director — to certify to Congress that each individual Syrian or Iraqi refugee is not a security threat before the refugee can be admitted into the U.S.
Fiction: The legislation would help us fight terrorism. Fact: “This legislation would introduce unnecessary and impractical requirements that would unacceptably hamper our efforts to assist some of the most vulnerable people in the world, many of whom are victims of terrorism, and would undermine our partners in the Middle East and Europe in addressing the Syrian refugee crisis.”- President Obama. Fiction: It’s easy for terrorists to pass through the current vetting process for refugees. Fact: Refugees who are resettled in the U.S. must undergo an extremely stringent and multi-layered vetting process which can take more than two years. Entering the U.S. as refugees would be the most difficult path available for terrorists to take to infiltrate our country. Fiction: We are already doing our fair share and can’t afford to accept more Syrian refugees because they will overrun our country. Fact: So far, the US has welcomed just a fraction of the 4 million registered refugees who have fled Syria. 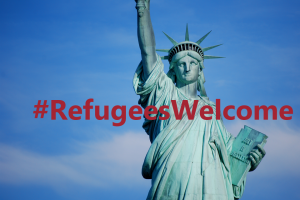 Since 2012, the US has accepted 2,174 Syrian refugees – roughly 0.0007% of America’s total population. Meanwhile, Lebanon has accepted 1,075,637 Syrian refugees, or 1/4th of their population, according to the United Nations High Commissioner for Refugees. Fiction: The U.S. doesn’t have the capacity to accept this many refugees. This is more refugees than the U.S. normally takes. Fact: The U.S. has historically led the world in refugee settlement. However, President Obama has only committed to taking 10,000 Syrian refugees in the coming fiscal year of 2016 as part of a limit of 85,000 total refugees. Germany has said it will accept 800,000 refugees in 2016 and is willing to accept 500,000 more each year after that for the next few years. Even our neighbor Canada has set a more ambitious target of accepting 25,000 Syrian refugees by the end of the year. As the world’s greatest nation, the U.S. has the capacity, and the moral responsibility, to do more to help these desperate people. Fiction: Rejecting Syrian refugees is a good strategy in the war against ISIS. Fact: Syrian and Iraqi refugees are also afraid of ISIS. They are fleeing the terrorism of ISIS and other extremist groups in the region. Fiction: Middle Easterners hate America because we’re the best. They want to take us back to the middle ages. They hate us ‘cause they ain’t us. Fact: Xenophobic rhetoric opposing Syrian refugees and calls to accept only Christian refugees helps ISIS by bolstering their message that America is intolerant of Muslims. Fiction: Syrian refugees won’t be able to make positive contributions to American society. Fact: Steve Jobs was the son of a Syrian migrant. Steve Jobs created the Iphone. The Iphone changed the word. Fiction: Arab American charities are just fronts to fund foreign terrorist organizations. They don’t actually help Americans. Fact: St. Jude Children’s Research Hospital was founded by Danny Thomas, an American comedian and actor of Syrian/Lebanese descent. He led fundraising efforts and turned to his fellow Arab-Americans to support the hospital by founding the American Lebanese Syrian Associated Charities (ALSAC). Today, ALSAC is the nation’s second largest health care charity* and is supported by the generosity of 9 million donors and the efforts of more than 1 million volunteers nationwide. Fiction: Guns don’t kill people, Muslims kill people. Fact: Making the vetting process and background checks for gun purchases in the U.S. more stringent would decrease the likelihood of terrorism in the U.S.
Fiction: Roof committed this act of terrorism because he was a Muslim refugee. If only we had kept out the Muslims and Arabs, America would be safe from terrorism. Tightening the laws on background checks for gun purchases in America will do nothing to stop terrorism. The only solution is to keep out the dang Muslims. If the victims of the Paris attacks had guns they would still be alive. Fact: In June, Dylann Roof, who is not Muslim and was born in the United States, opened fire and killed 9 Americans in a historically black church in South Carolina. FBI Director James Comey admitted that failures in the FBI’s background-check system allowed Roof to purchase the gun, despite having a criminal record. Fiction: There is nothing we can do to help Syrian refugees. Congress doesn’t listen to Arab their constituents. Fact: It is important for you to urge your Senators to support Syrian refugees and vote against the Senate version of the anti-refugee bill passed by the House. Take Action: Click here to support refugees.